Welcome to this family site. We hope you will find it of some interest. If you have one of these relatively rare names, or any of the derivatives, as surnames, and have information of interest, we will be delighted if you want to add to the site. Click on the Contact section to email us. This name was known to derive from the name Borgognone. In the United Kingdom it was believed the name was changed by deed poll in the early 1900s. Borgognone is an adjective of nationality used to identify someone from the Burgundy region of France. Burgundy was formerly a kingdom, province and duchy of varying extent and was peopled by a Germanic tribe around the 5th century. The name was first documented in Italy during the 11th century and appears today mostly in the Tuscany and Bologna area of northern Italy. The modern spanish word for 'Burgundian' is 'borgoñón'! However, we think that the name change from Borgognon to 'Borgonon' in England, in the early part of the 20th century, was more about dealing with english difficulties of pronunciation! And....it is still regularly misspelt and mispronounced! Gules, three dogs rampant argent, the first two affrontee; a chief azure, charged with a label of four pendant gules, between each pendant a fleur-de-lis or. Gules (red) denotes fortitude. We show it here for interest.....but both he and the webmaster would be interested in any information leading to records of the real arms described above and awarded to the Borgognoni family in Italy. See the USA records for further details of this branch. Borgogno, Borgogna, Borgognini, Borgognon, Borgonon. .... but the Webmaster does not know this for certain. A check of the on line Aliens Register (series 1842-1846) for Brighton states: "Tho Borgognon arrived on the "Frame" from Dieppe to Brighton on 26 July 1844." Several people with the name 'Borgognon' arrived from this french port in around 5 years of this time at various UK south coast ports. Could this be Theophile Anne Michel Borgognon? Frustratingly, apart from the further reference below,Theophile cannot be traced in any subsequent online census records. First UK records appear about 1857, when Theophile Anne Michel Borgognon married Anne Victorine Pelletier in London. We have no birth or death record of T A M Borgognon, but the death of his wife Victorine Anne Borgognon (née Pelletier) at age 71, is recorded in 1903. Victorine registered in the 1901 Census as a widow living at 35 Murchison Road in Leyton, London, aged 69. She is recorded as "living on her own means" and having been born: "France-French subject". Unfortunately, the census record does not state where! If TAM Borgognon was of similar age and died a few years earlier, this might put his birth into the 1820s if he married in his early to mid 20s. In the 1903 death certificate of Victorine, she is recorded as 'widow of Theophile Borgognon, teacher of French and Drawing'. There is an entry in White's 1857 Directory of Derbyshire which refers to a Mons T Borgognon as being a French & Drawing Master at the Free Grammar or St Helen's School situated on the Sheffield Road in Chesterfield. Searches of records of this area have not so far revealed any further reference to Theophile so it seems as he may have moved back to London soon after 1857. The issue from these marriages are the present generation and their offspring believed to be living in the United Kingdom. One offspring from these marriages is living in Australia and a daughter of his lives in France, also with a daughter. As far as is known at present, the number of people living in the UK still with the surname Borgonon is very small. Living generations carrying the family names are deliberately not mentioned in the genealogy. However, if you would like to add any details to the above UK family tree, or, if you are a resident elsewhere and have a family tree of your own, this can be added to the website. If immigration occurred say, in the 1790's or earlier, then there may be records which originally were kept in St Giles Church, Cripplegate, but which were subsequently moved to the Guildhall in London. There may be cemetery records in Chingford Mount Cemetery (Anne Victorine Pelletier is buried here) and in Abney Park Cemetery (Plot RN 20042 Sq D5), Stoke Newington. (Borgonons, Alfred Victor, 1854-1926, Caroline Elizabeth(1855-1924), Percy James, 1888-1918, are known by cemetery records to be buried in Abney Park. Both of these burial grounds are in the London suburbs. Penelope, granddaughter of the above named Eric Francis, reports a cousin, Dan, has actually changed his name to Borgonon, as her father 'had always been a father figure' to him. A lot of this information was gathered by a friend working in London in the 1960's and is conjecture; no further research has been done to date. Emailer from Argentina greets all of our those called by all variations of the name and reports families of the name Borgoñon or Borgognon living in the Province of Cordoba, along with other variants of the name! A correspondent from Canada reports that a few Borgognons live in the province of Quebec in the city of Montreal. In the late 70's, her family moved to Canada - being before resident in Kenya. Originally the family were from Switzerland (Canton de Vaud and Canton de Fribourg). Although this webmaster has two living relatives in Paris carrying the name Borgonon, we have no records of the name Borgonon appearing in France earlier than the present generation, or of any early family connections. The following surnames currently appear in France and may be derivatives of Borgognon: Borgnon, Borgo, Borgonovi, Bourguignon. You can contact the webmaster in French. Historically, it is known that there was emigration from the Burgundian region of France around the 17th century, and earlier and the name, in various forms, still appears in Northern Italy. 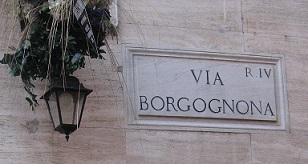 Webmaster has received notice that at least one family in Rome has the name Borgognoni. Also, reports came in that on the italian island of Procida, off the coast by Naples, several residents have the name 'Borgogna' and my correspondent says an ancestor Alessandro Borgogna came to the island some 150 years ago. From Tuscany comes the news that the name appears as 'Borgogni'. It is difficult to know whether the name variations are in any way linked: several different people or families, with quite different local names, may have emigrated from the Burgundy region over a long period. It seems there is plenty of room for research in Italy for anyone who is able to take it up! Use the website to keep us all up to date! If ever you have the opportunity to visit Venice, go to the island of Torcello (Vaporettos 6,12,14) and stroll down the Via Borgognoni, which is actually more of a footpath than a street. Why does such a street name exist? You can use Italian, French, or English to contact the webmaster. Just recently we heard from the one place we expected to hear from, much much earlier....Spain! A 'Borgoñón' who lives in Valencia, contacted the site - there are around 30 people known with this name which comes from a great grandfather who was born in a village called " La Puebla de Arenoso ", also in Valencia province. Our contact says the name is 'strange enough' in Spain. (Just like England!) Frankly, we expected the name to appear more often...if you are out there do let us know so we can add any 'sightings' to the site. You can contact us in spanish. A report from Sweden shows the name 'Borgogno' appearing in Sweden but no further details as yet! There are several families in Switzerland carrying the name 'Borgognon'. A group in the Friborg and Vaud area have a website giving brief details of their existance and indicating emigration to countries as diverse as Paraguay and Canada. The Swiss names appear to have been in the area for several hundred years. News from Paraguay confirms that there are quite a number of families with the name Borgognon alive and well living in this country, There are also connections with relatives now living in Denver, Colorado. The Webmaster is promised more information when it becomes available. Three brothers Cesare, Ruggero, and Guiseppi, with the family name, Borgognoni from Ancona, Italy are known to have settled in the USA in the Delta (Mississippi) at the beginning of the 20th century. A recent correspondent reports she was born to Jose and Susanna Borgognone. Her father was born in 1932 to Salvadore Borgognone. Salvadore was born in the province of Agrigento Sicily, Italy. Story has it that he was a prisoner of war during WW1, was exiled to Austria, then made his way to Rosario in Argentina. He made a living as a mason. Her father, Jose then immigrated to the US in 1970. A correspondent from Memphis, Tennessee, reports that his great grandfather, Ettore Borgognoni from Bologna, emigrated to the USA in 1912, possibly with his brother Pietro. Their sisters Gilsomina and Vittorina remained in Italy. They settled in Ladd, Illinois and surrounding towns like Mark & Cherry, and worked in the coal mines. Ladd, population about 1300, is still about 25% Italian. In the 1930s the Borgognoni name in our correspondent's family was shortened to Borgon, creating yet another derivative!. Another correspondent reports that her father was brought up by an Italian step father, Tullio Borgogno, who emigrated to the USA in 1918 from Scurelle and Telve in the Austrian Tirol, though this is now a part of Italy. This is the first report we have of emigration from what was then Austria! Webmaster continues to welcome input from anyone living in the USA who could contribute further information which we will be pleased to add to the site. A report from Venezuela tells of a Borgognon living in Barquisimeto who was actually born in Italy in the village of San Guistino in Perugia Province. He sends greetings to all Borgognons! There appears to be a notable existence of artistic merit running through the generations. It is believed there are or were professional musicians in the USA carrying the name. A number of members of UK families have been involved in choral or drama activities over the years, some 19th century name bearers were engravers. One current nameholder is a professional film actor in Australia. More distantly in time, there are interesting references to one Giacomo Borgognone, a french painter, born in St Hippolyte, Franche-Comté, 12 February 1621. Aged 15 years, he moved from Dijon to Italy, served 3 years in the Spanish army, was a member of the Society of Jesus and made a name for himself as a painter of battle scenes.Actually, his name was Jaques Courtois when he left France, but he was called Il Borgognone in Italy. By all accounts he led a colourful life as artist, soldier and priest. He is noted for his battle scenes, although he later did some religious work. He died in 1676. Some pictures of his survive in London's Wallace Collection and the British Museum, 3 others are in Edinburgh and one is in Chatsworth House, Derbyshire. We have no knowledge which suggests that this person can be linked to present day generations. No artisitic traits got as far as your Webmaster! The Burgundians or Burgundes were an East Germanic tribe which may have emigrated from Scandinavia to the island of Bornholm, whose old form in Old Norse still was Burgundarholmr (the Island of the Burgundians), and from here to mainland Europe. In the Thorstein saga Víkingssonar, Veseti settled in an island or holm, which was called Borgund's holm. Alfred the Great's translation of Orosius uses the name Burgenda land. The poet and early mythologist Victor Rydberg (18281895), (Our Fathers' Godsaga) asserted from an early medieval source, Vita Sigismundi, that the Burgundians themselves retained oral traditions about their Scandinavian origin, but the Vita is a much later source. Other sources, including Tacitus, make no mention of the original homeland of the Burgundians. After possibly having dwelt in the Vistula basin, according to the mid-6th century historian of the Goths, Jordanes, they were beaten there in battle by Fastida, king of the Gepids and were overwhelmed, almost annihilated. They migrated westwards in the 4th century CE, and settled in the Rhine Valley during the Völkerwanderung, or Germanic migrations. Somewhere in the east they were converted to the Arian form of Christianity, which long sustained a gulf of suspicion and distrust between Burgundians and the Catholic Roman Empire of the West. Divisions were evidently healed or healing, circa AD 500, however, as Gundobad, the second to last Burgundian king, maintained a close personal friendship with Avitus, the Catholic bishop of Vienna. Moreover, Gundobad's son and successor, Sigismund, was himself a Catholic, and there is evidence that many of the Burgundian people had converted by this time as well, including several female members of the ruling family. In the Rhineland, though the Burgundians were nominally Roman foederati, they periodically raided portions of eastern Gaul. Burgundians lived in an uneasy relationship with the imperial Roman government: in 370 the western Emperor Valentinian I attempted to enlist the Burgundians against their enemies the Alamanni, promising to support them with Roman forces. Negotiations with the Burgundians broke down when Valentinian, not understanding that a Germannic treaty was essentially a personal bond, refused to meet with the Burgundian envoys and give them his promise of Roman support. In 411, the Burgundian king Gundahar or "Gundicar" set up a puppet emperor, Jovinus, in cooperation with Goar, king of the Alans. With the authority of the Gallic emperor that he controlled, Gundahar settled on the left bank of the Rhine (the Roman side) between the river Lauter and the Nahe. Burgundian raids into Roman Upper Gallia_Belgica became intolerable and were ruthlessly brought to an end in 436, when the Roman general Aëtius called in Hun mercenaries who overwhelmed the Rhineland kingdom (with its capital at the old Celtic Roman settlement of Borbetomagus Worms) in 437. 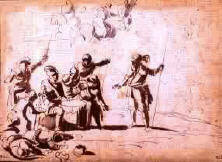 Gundahar was killed in the fighting, reportedly along with the majority of the Burgundian tribe. The destruction of Worms and the Burgundian kingdom by the Huns became the subject of heroic legends that were afterwards incorporated in the Nibelungenliedon which Wagner based his Ring Cycle where King Gunther (Gundahar) and Queen Brünhild hold their court at Worms, and Siegfried comes to woo Kriemhild. (In Old Norse sources the names are Gunnar, Brynhild, and Gudrún as normally rendered in English.) In fact, the Atli of the Nibelungenlied is based on Attila the Hun. Under the new king Gunderic (died c. 473), the refugees from the destruction were settled by Aëtius near Lugdunensis, known today as Lyon, which was formally the capital of the new Burgundian kingdom by 461. In all, eight Burgundians kings of the house of Gundahar ruled until the kingdom was overrrun by the Franks in 534. As foederati or allies of Rome in its last decades, the Burgundians fought alongside Aetius and a confederation of Visigoths and others in the final defeat of Attila at the Battle of Chalons ("Catalaunian Fields") in 451. But Burgundian support couldn't invariably be counted on as the Western empire foundered. An ambiguous reference infidoque tibi Burdundio ductu (Sidonius Apollinaris in Panegyr. Avit. 442.) implicates an unnamed treacherous Burgundian leader in the murder of the emperor Maxentius, which lead directly to the sack of Rome by the Vandals in 455. Perhaps Burgundian concerns lay elsewhere: two Burgundian leaders Chilperic and Gundioc accompanied the Visigothic king Theodoric in his invasion of Spain later that same year, according to Jordanes, Getica (ch.231). The Burgundians were extending their power over southeastern Gaul; that is, northern Italy, western Switzerland, and southeastern France. In 493 Clovis, king of the Franks, married the Burgundian princess Clotilda, daughter of Chilperic. At first allies with Clovis' Franks against the Visigoths in the early 6th century, the Burgundians were eventually conquered by the Franks in 534 CE. The Burgundian kingdom was made part of the Merovingian kingdoms, and the Burgundians themselves were by and large absorbed as well. One of the earliest Germanic legal codes, the Lex Gundobada or Lex Burgundiorum, is a written collection of laws issued by King Gundobad, (reigned 474 - 516 AD) the best-known of the Burgundian kings. The Lex Gundobada was a record of Burgundian customary law and is typical of the many Germanic law codes from the period. The Lex Romana Burgundionum was Gundobad's contribution towards providing laws for his Roman subjects as well as the Burgundians. Finally, King Sigismund, who died 523/4 had the Burgundian Prima Constitutio written down. The name of the Burgundians has since remained connected to the area of modern France that still bears their name: see the later history of Burgundy. Between the 6th and 20th centuries, however, the boundaries and political connections of this area have changed frequently; none of those changes have had anything to do with the original Burgundians. The name Burgundians used here and generally used by English writers to refer to the Burgundes, is a later formation and more precisely refers to the inhabitants of the territory of Burgundy which was named from the people called Burgundes. Since this site was launched nearly 6 years ago, your Webmaster has been amazed at the response and the extent to which this family name has reached so many countries! We still do not know how, why & when so many people spread so far in the world & I only have data going back just over 100 years about my own family in the UK though it seems pretty certain that there was a wave of several skilled trades people emigating from France in the period 1800 to the 1850s. Family legend has it that it was mandatory to speak French at mealtimes up until the 1900s when this excellent habit died out! So Webmaster will be very pleased to make amendments and additions; just contact me at gvborgo@borgognon.net. Looking forward to hearing from you soon and hope this site has stimulated your interest and can thereby become a useful tool for anyone interested in the genealogy of this clan! The Webmaster makes no claims to absolute accuracy on this site. Information has been gathered over many years and, as the family has been geographically widespread, there has been infrequent or little contact beween branches. The webmaster would welcome any input to correct or add to information. No living members are mentioned anywhere on the site unless they give express written permission. I will endeavour to keep the site updated with any further information received but reserve the right of editorship on any material to be put on the site.